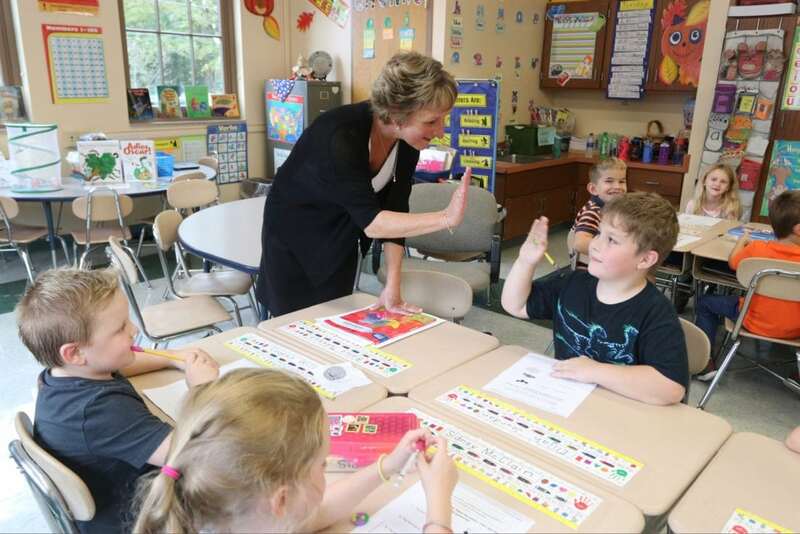 KAREN VIBERT-KENNEDY/Sun-Gazette Ferrell Elementary School Principal Jill Warg visits with the first grade, taught by Mary Smith, and gives a high five to Elijah Jourdan at the school in Picture Rocks on Tuesday. The school recently was recognized as a National Blue Ribbon School. PICTURE ROCKS — George A. Ferrell Elementary School was named a National Blue Ribbon School for 2018 by the Department of Education and was announced by Betsy DeVos, U.S. Secretary of Education. The school is among 19 schools from Pennsylvania and others across the country to receive the recognition. Ferrell was recognized in the category of exemplary high performing schools. According to Michael Pawlik, superintendent for the East Lycoming School District, this category is based on a number of indicators, such as high performance and high growth scores. “Not only did they get a good grade, but they did better than the year before,” he said. Pawlik noted the high level of achievement at Ferrell is indicative of all the schools in the East Lycoming School District. During the 36 years it’s been in place, the National Blue Ribbon Schools program has honored more than 8,800 schools. This is the second time Ferrell Elementary has received the honor, having been recognized in 2008. Ferrell’s principal, Jill Warg, attributed the commitment and longevity of the staff as the reason for the school’s success. Warg noted there are five teachers at the school, which houses seven grades, who have been there for 25 to 40 years. She compared teachers to coaches of a winning sports team. “Everyone knows the longer coaches stay, the better the team,” she said. She commended her staff for their dedication to the students. “They’re committed to the students. They don’t do it for the prize. They do it because it’s the right thing to do,” she said. Warg, who has been principal at Ferrell for four years, described the school as very family-focused. “Parents go to everything,” she said, noting that it’s not unusual, if there is an event, to see parents lined up to attend. “I am proud of what we have here,” she added. In November, Warg, Pawlik and Mary Smith, who has taught first grade for 40 years at Ferrell, will travel to Washington to receive the award. Warg said plans are in the works to have some type of celebration in the community to recognize the honor.